Improve your employees' moral with HR management service from Human Resource Management LLC of Caldwell, Idaho. Human resource is a necessity in today's competitive and legal environment. Whether your organization has one or twenty employees, compliance is necessary at all levels. As a business owner or manager, having general knowledge is important. At Human Resource Management LLC, we understand the difficulty in keeping abreast of the constant changes in the law. Strong employer human resources and practices accelerate company development, competitiveness, and profitability. While it is important to know your strengths and build upon them, it is likewise important to understand your weaknesses and change them. 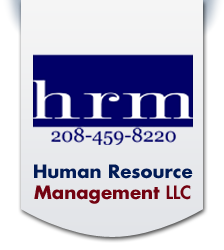 Contact us to request more information about our HR management services from Caldwell, Idaho.